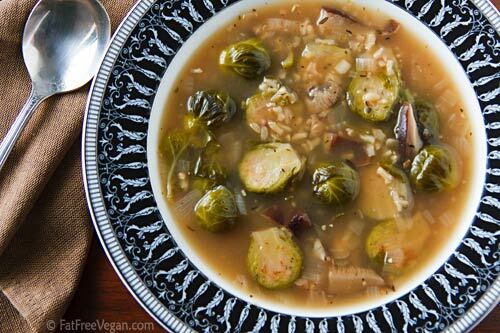 Shiitake mushrooms create a wonderfully rich and flavorful broth for this vegan brussels sprouts soup, which is full of the taste and aroma of Thanksgiving. Mushrooms! But don’t worry, I wouldn’t be crazy enough to risk my family’s life on any old mushrooms. 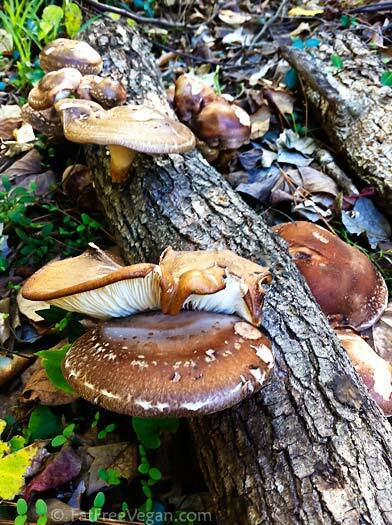 These were shiitake mushrooms that I had “planted” in this log about a year and a half ago. I’d ordered plugs of mushroom spawn from Fungi Perfecti, drilled numerous holes in three oak logs, and hammered the plugs in. I thought that was the hard work, but then I read that I was supposed to water the logs every day. Somehow after a few weeks, “every day” turned into “infrequently” and then into “not at all.” The logs showed no sign of sprouting anything, and I’d given up checking them for signs of life. So I was thrilled when I just happened to notice one of the logs in full-bloom, though I hate to think how many mushrooms went to waste because of my lack of attention. I’m now going to start pampering the other two logs, which contain the spores of exotic Lion’s Mane and Maitake (I think–it’s been so long) mushrooms. I harvested the biggest of the mushrooms and used them as the basis of this main-dish soup. Shiitakes create a wonderfully rich and flavorful broth, so if you can find them at a reasonable price, I strongly recommend them. If fresh shiitakes aren’t available, consider using dried: Reconstitute 2-3 ounces of dried shiitakes in hot water until soft, and strain the liquid through a coffee filter to remove all grit before using the mushrooms and the liquid in the soup. If dried shiitakes aren’t an option, use any flavorful mushroom with, perhaps, vegetable broth instead of water. With beans added, this is a hearty soup, full of the flavors of fall, that would make a nice addition to your Thanksgiving menu. You can serve this with or without the beans, but adding them makes this soup into a one-pot meal. Heat a large, non-stick pot. Add the onion and cook, stirring, until it becomes translucent. Add the Brussels sprouts and cook until onion begins to brown, about 2 more minutes. Add the mushrooms and garlic and cook for about two more minutes. Add all remaining ingredients except for the optional ingredients. Cover and simmer on low heat until rice is cooked, about 50 minutes. Check seasonings and add more along with the lemon juice, if desired. If you’re using the beans, add them and the broth and cook for about 15 more minutes. Nutrition data below includes beans. 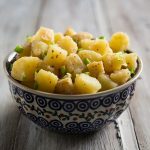 Without beans: Calories: 175, Calories From Fat: 10, Total Fat: 1.2g, Cholesterol: 0mg, Sodium: 726mg, Potassium: 607.1mg, Carbohydrates: 38g, Fiber: 6.9g, Sugar: 5.6g, Protein: 6.9g. I know that some of you are already planning your Thanksgiving menus, so I’ve tried to make it a little easier by labeling some of my more Thanksgivingy recipes with a tag. The recipes stretch over several pages, so click the “Previous Entries” link at the bottom of each page. For some more Thanksgiving ideas that include recipes on the FFV Recipes site, check out the bottom of this post. I can’t wait to try this recipe! I’ll just leave out the beans and it is perfectly Paleo. Thanks! I discovered your website a couple of months ago & have been following your posts on Facebook. I so appreciate your easy & thoughtful recipes and your down-to-earth attitude. I’ve been a vegetarian for 40 years & am well on my way to veganism. It hasn’t been a difficult transition for me since I keep in mind that I strive to have as low an impact on my environment as I can, & veganism certainly helps with that goal. Guess what I’ll be having for dinner tomorrow night? A new fan on the southern Oregon Coast. Sorry major typos using my nook. Trying to say it was an instant favorite. So yummy! Thinking of doing this in the pressure cooker…? like 15 mins for this rice. I’ll let you know how it comes out! Please do! That would be a time-saver. I can’t see why not. Hope you enjoy it! I’ll be trying this. Thanks. I think it’ll last at least a week in the fridge, six months in the freezer. I really want to grow mushrooms, it looks like so much fun! It’s been raining so much here that it could totally happen without daily watering I bet. The soup looks terrific! I love brussels. Probably a silly question, but do you measure 6 oz of mushrooms and then de-stem or measure them after? Thanks! 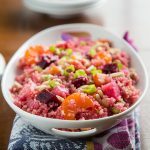 This sounds delicious and I have some Brussel sprouts I need to use so it is going on the menu for this week. Not silly at all! Sometimes it can be hard to tell. In this recipe, the mushrooms are weighed before stemming them. The way to tell is if it says “6 ounces shiitake mushrooms, stemmed and sliced,” the weighing comes first. If it says “6 ounces stemmed, sliced mushrooms,” the mushrooms are stemmed and sliced before weighing. It’s a subtle difference, but one that professional recipe writers use. Cara, rehydrate 2-3 ounces of dried shiitakes in hot water until soft, and strain the liquid through a coffee filter to remove all grit before adding the mushrooms and the liquid to the soup. If the mushrooms are whole, you will have to slice them after rehydrating. 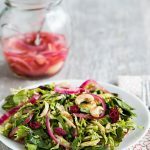 Hi–can this recipe be made with frozen brussels sprouts? Love your blog! Sure, I think frozen would be ok.
Oh my goodness, I love the story about your mushrooms! I am a big fan of all mushrooms, and I hadn’t really thought of that before. What a brilliant idea to grow your own. And amazing photographs as usual! Will be making your miso soup tonight and a few of your sides for Thanksgiving. Thanks as always for the tried & true recipes, Susan! Why, thank you, Alina! To me, that is the highest of compliments. I tend to take a long time writing the intros to the recipes, even though I fear that most people don’t read them. I really appreciate your noticing. I’m slightly addicted to this soup! 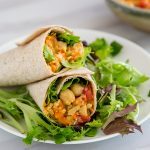 I made this last night and omigosh it was sooo good – words cannot fully describe! Thank you for yet another keeper. I found gorgeous little brussel sprouts on sale and loaded up my cart. After three days of roasted Brussel sprouts I needed a change. 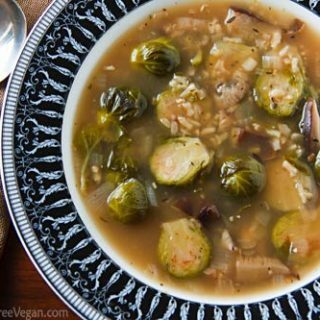 Being December I took a chance and typed “brussel sprouts soup” -w hat a stroke of luck to find this recipe as I just happened to have shitake mushrooms too. I tossed everything in the crockpot using hulless barley in place of the rice. After simmering all morning, I just “sampled” two heaping bowls full. It is not a filling soup, but is flavorful and nourishing. This recipe is a keeper!!!!! I frequently enjoy your recipes (THANK YOU) but this one just begged me to write you. This soup not only looks delicious–it lives up to its looks. 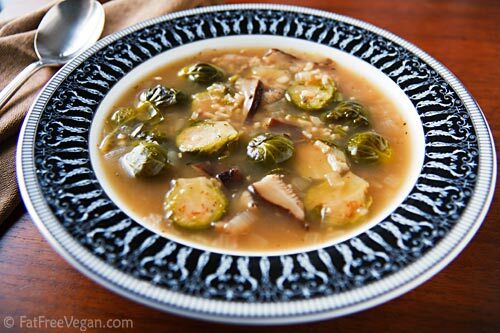 I’m not a big fan of mushrooms but I am a fan of brussels sprouts–this was a delightful surprise and is now a favorite. I have made this recipe countless times. I’m a lover of Brussels and shitake. It’s like comfort food without sinning. Great recipe. I noticed a very old comment from 2012 about making this in a pressure cooker. Since they didn’t end up reporting back, I just wanted to let everyone know that I made this tonight in my InstantPot. I used the manual setting for 20 minutes and it came out great. Thanks for the recipe!! Thanks so much for trying it and reporting back! Did you use a natural pressure release? No, I was impatient (and hungry) and used the quick release! How can I adapt this for the Insta pot? Less broth and 20 min at high pressure? Or is this soup much better the stove top way? Sorry I just noticed the previous comment with the instant pot instructions! !